Littoral Combat Ship (LCS) Stern Ramps - Operate as an integral part of the stern door and ramp system. The main ramp assembly deploys downward from the decking with a 15 degree range of motion from stowed to fully deployed. The ramp has a capacity of 10,250 kg and can go from stowed to fully deployed in 60 seconds. When operated, the ramp provides positive buoyancy with a fully opened height between the ramp and the bottom of the overhead ship structure being approximately 6 feet 6 inches. 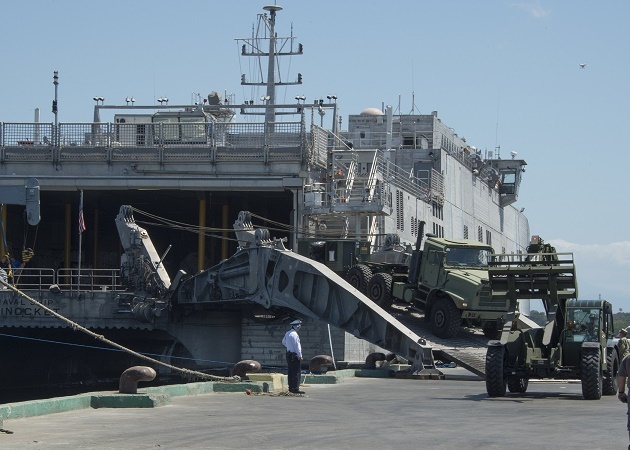 The Expeditionary Fast Transport (T-EPF) Stern Ramp - Hydraulically powered bi-folding aluminum ramp installed on the aft end of a T-EPF for on/off load capability. This type of ramp is capable of interfacing with Roll-on/Roll-off Discharge Facilities (RRDF), piers, quay walls and other austere on-and off-load facilites. The ramp is capable of slewing from dead astern to 45 degrees from the vessel’s centerline towards the starboard. The ramp is designed to support the loads associated with the M1A2 Abrams MBT and a fully loaded M1070 Military Truck with Trailer.